Schools, health care facilities, medical offices, private homes, hospitals, libraries...anywhere there are people there is a need for nature. Remember how wonderful you feel when you're outside and hear birds singing? No matter what else is going on in your life, for that moment the bird song signals all is well with the world. Experience the color, sound and movement of birds in a natural setting with Living Design. Your aviary is an excellent marketing tool. In a competitive environment, Homes without an aviary are often at a disadvantage. Your aviary fills beds by bringing new residents whose families want “something more” than just physical care. 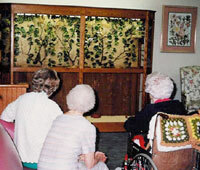 A Living Design aviary is a way to do something extraordinary for your residents... a visible sign of the quality care you provide. The aviary is therapy that doesn't look like therapy. 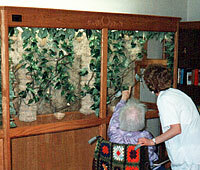 Residents enjoy the birds one on one or in small groups. The sight and sound of the birds affects our sense of well-being. Bird watching increases attention span, aids in stress reduction, stimulates discussions and has positive effects on depression. Through the use of aviary-centered activities, you can provide an outlet for residents, regardless of skill level. It relaxes hyperactive residents and focuses attention of special needs residents. Your aviary can help in the healing process by bringing back the role that pets played in their life – putting residents back in touch with nature. 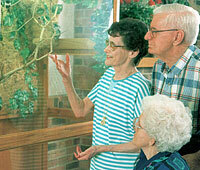 Your aviary builds staff/resident relationships by developing positive communication and interaction. It can provide stress relief for your staff by calming and focusing residents – making their jobs easier.